Have complicated XML files? Try our Total XML Converter. Have a desktop converter that works without Internet. Total XML Converter converts XML files to the widest list of output file formats: PDF, JSON, CSV, TXT, HTML, XLSX, SQL, XML, RTF, DOC, TIFF, JPEG, PNG, ACCESS, DBF. If you have an XSLT file, you can add to to the app for the right transformation. Convert XML in 3 ways: expand to table form, highlight XML tree or create a report. Add the page counter or any text watermark to each page of the output file. Our batch XML converter is very flexible: you can rely on default settings or change any of them to your needs. During conversion all XML elements are transferred with the utmost accuracy. The interface is strightforward and good for both beginners and advanced users. 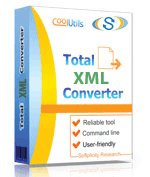 With Total XML Converter you can extract images from XML files. Just one button for any number of files and you get the images in a new folder. When you convert XML to JSON, select compact (al text in one line) or indented (human readable) view. Want to add your logo? Use the header option: add any image you like. Our app converts xml file or several folders in one process so that you could save time. Convert XML to CSV format and select comma and separator. Combine tables from different XML files when you convert XML files to CSV. Total XML Converter can be run via command line ( you can get the command line from GUI in 1 click). Description JPG is the file format for images made by digital cameras and spread throughout the world wide web. Saving in JPG format an image loses its quality, because of the size compression. But at the end you have a much smaller file easy to archive, send, and publish in the web. These are the cases when an image's size matters more than image's quality. Nonetheless, by using professional software you can select the compression degree and so affect the image's quality.